Sustain: That long, luscious, lingering sound that attracted us to playing the dulcimer. Just about everyone who plays the dulcimer tells me it’s the sound that lures them toward playing, and I assume they’re referring to sustain more than anything else. But once we begin playing, all of a sudden the very thing that appeals becomes a hindrance to the tune, the harmony, the arrangement, to our ears…. Why? Well, maybe that’s because the sustain also sounds a little too loud and bright (the reasons behind this are another subject altogether). Still, dulcimer players do their best to “avoid” sustain (at least one builder has admitted to building it out of his instruments! ), either by rigging damper systems on dulcimers or ornamenting a tune ad nauseum (and before its time, yet another subject). When I asked dulcimer players to define “embellishment” in a questionnaire I’d assembled in 1998, one person defined it by including two statements relating to sustain. The first was: “Filling in the silent spaces.” I find this comment interesting, because the “spaces” between notes are anything but silent to my ear. After this statement from the same person came, “Not letting the dulcimer ring.” Huh? Isn’t “ringing” what we like about the dulcimer? I’m confused! What, then, do we do with this two-edged sword? Do we resort to damper systems? (Seems to me that if we’re going to go that far, we might as well play the piano!) Dampers are certainly a sound option to us, but we don’t have to totally turn off the sustain. There is a happy medium we can strike here (no pun intended). To me, sustain is the dulcimer’s glory, which we can choose to work with or against. It’s therefore important to understand what sustain is, according to how each dulcimer wields it, and how to use it to advantage, as well as how best to control a long sustain. (Remember, you can’t make a short sustain longer, but there are ways to mask a long sustain to sound shorter.) If you perceive sustain to be your worst nightmare, I’ll hope that what follows will help you make it your best friend. To check your dulcimer’s sustain; you’ll need your dulcimer, hammers, and a watch or clock with a second hand. In your dominant hand, hold one hammer; in the other, hold the stopwatch (or nothing, if you’re watching the clock). On the right side of the treble bridge, firmly strike the G course in the middle of the strings, and time the sustain to see how long it lasts. When you time the sustain, just sit or stand at the dulcimer as you do normally; don’t lean over to set your ear close to the strings. Then one more test: Strike the string, set the timer and quietly walk 10-15 feet away, to time what you hear from there. The timing may or may not be shorter. For reels, jigs and other fast, single-line tunes for which only the melody itself is played, choose your tunes “carefully”: Just about any fiddle tune works on the dulcimer, of course, but for me as a solo performer (and I mean solo: no piano, no nuthin’), I take a little more care in choosing my tunes so that the sustain can take the time to “accompany” them. I embrace tunes whose notes skip around and save the tunes whose notes move step by step for times when accompaniment is available. French-Canadian and some American old-time tunes are good picks for dulcimer-sustain-generated accompaniment. For solo pieces where the tune includes rolled chords underneath: Space rolled chords apart enough to prevent harmonic overlap/mush, not with every note or beat. In 4/4, beat 1 almost always gets a chord. Beat 3 might get a chord, but a double stop (two tones struck simultaneously) may really serve the situation better. Beats 2 & 4 often sound by themselves, but sometimes I may play double stops there, too, so either 1chord, 2, 3chord 4, or 1chord, 2dstop, 3chord, 4dstop. In 3/4, I usually play a chord on beat 1 and a double stop on beat 3. Which way the harmony goes depends on tempo, what kind of harmony the tune says it needs, what kind of feel the tune says it wants (maybe sound a chord on beat 1 only for an even quieter sound–it all depends…). Does that pretty song really need “brrrs” on some melody notes? (I call these multiple-bounce strokes, where the hammer bounces several times within one arm stroke): These may seem cool or offer accomplishment for some players, but this sound can be amazingly unpleasant if unfortunately placed. Recording your playing and stopping to listen may help here: Listen to “brrr” elements in the context of the music to hear how they work, or don’t. For slow, simple tunes: Let the sustain of certain choice notes in the melody (often low tones, but they can be anything) speak for themselves and accompany the tune. 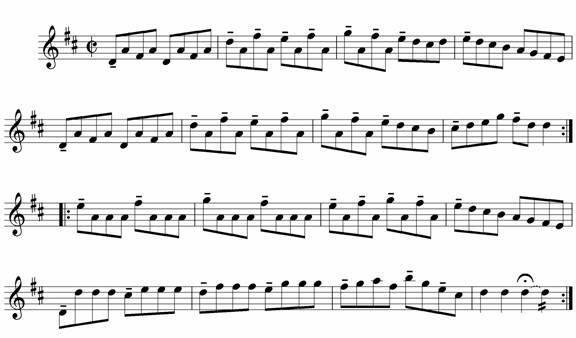 In the first verse to my arrangement of “Amazing Grace,” beat 3 of most measures does the accompanying. Also, rather than accent accompaniment notes on slow tunes that are intended to be played legato, I “lean into” those notes, rather than strike a hard accent, to give them just enough emphasis to ring a little longer under or over the tune. A short sustain on a dulcimer sets the sound equation differently! While my experience here is limited, what I have noticed from briefly playing short-sustain dulcimers is this: To make chords work well under a tune, I chord more frequently in slow tunes than what I described in 3 above. Quicker-paced tunes seem to get on okay with some space between chords, adding a solid, rhythmic element. In short, support the tune with chords or double stops as it needs it. So, don’t be afraid of sustain! (After all, it’s only sound.) To help you begin to explore the wonders of sustain, shown below is “Cincinnati”, one of my favorite tunes in Striking Out and Winning!, shown with “lean-ins” rather than accents, shown by the tenuto lines drawn over selected notes (where to strike the strings appears with the tune in the book). While it’s possible to place accents both on and off each beat (on the first or third eighth note of each beamed group respectively), my accent placement here is defined more by the shape of the tune; for example, in the first three measures, each A can be part of the melody, or can be interpreted as accompaniment to the other pitches sounded in that area (which means only half the notes are melody). Because the accents are irregular, it may take a while to get a feel for where they go, but the end result sound-wise is awesome. For a related article on this topic, click here.